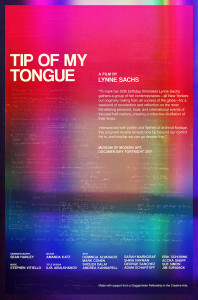 In October 2018, Filmwax Podcaster Adam Schartoff interviewed Lynne and two participant/performers in her film “Tip of My Tongue”. 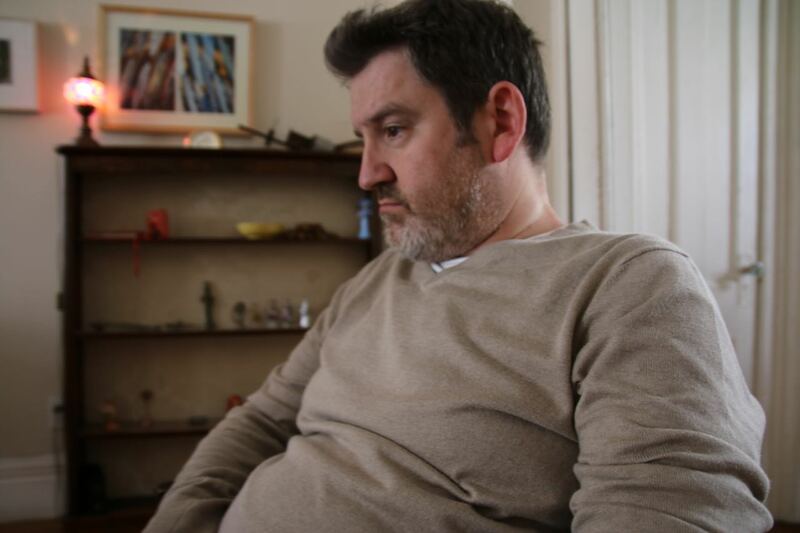 Adam himself was an integral part of the film, since he two turned 50 in the early 1960s and was ready, willing, and able to open his soul and his memories to our creative process. To celebrate her 50th birthday, filmmaker Lynne Sachs gathered together other people, men and women, who have lived through precisely the same years but come from places like Iran or Cuba or Australia or the Lower East Side, not Memphis, Tennessee where Sachs grew up. She invites 12 fellow New Yorkers – born across several continents in the 1960s – to spend a weekend with her making a movie. Together they discuss some of the most salient, strange, and revealing moments of their lives in a brash, self-reflexive examination of the way in which uncontrollable events outside our own domestic universe impact who we are. All caught in her fabulous film “Tip of My Tongue”. 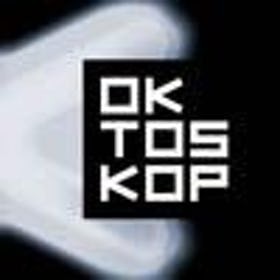 Oktoskop TV’s Lukas Maurer interviewed Lynne in NYC in conjunction with the broadcast of her film Tip of My Tongue on Austrian TV in June 2018. A 50th birthday is often an opportunity to reflect. US-American filmmaker Lynne Sachs does so in a clear and completely unsentimental manner. Therefore, her experimental birthday film Tip of my Tongue transcends the conventional “portrait of a half-century”. Shot in one location over the course of one weekend, the individual and collective memory converge in what becomes a poetic as well as eminently political film. In conversation with Lukas Maurer, Lynne Sachs explains how she planned the shoot, why it was important to her to stage it in one location, and how she gathered people from every continent. And the City, which in the film is present particularly through the soundscape, makes itself noticeable also in this interview: Oktoskop Curator Lukas Maurer visited the artist in her studio in New York. Ein 50. Geburtstag ist oft Anlass um zurück zu schauen. Die US-amerikanische Filmemacherin Lynn Sachs tut das mit einem klaren, vollkommen unsentimentalen Blick. Ihr experimenteller Geburtstagsfilm Tip of my Tongue” wird dadurch weit mehr als das herkömmlich Portrait eines halben Jahrhunderts. An einem Ort und während eines Wochenendes gedreht, verschränken sich individuelle mit kollektiven Erinnerungen zu einem ebenso poetischen wie eminent politischen Film. Im Gespräch mit Lukas Maurer erzählt Lynn Sachs wie sie den Dreh Arbeit geplant hat, warum es ihr wichtig war, dass alles an einem einzigen Ort statt fand und wie sie dort Menschen von allen Kontinenten versammelte. Und die Stadt, die im Film vor allem als Sound präsent ist, macht sich auch während des Gesprächs bemerkbar: Denn Oktoskop-Kurator Lukas Maurer hat die Künstlerin in ihrem New Yorker Atelier getroffen. Featuring: Tip of My Tongue by Lynne Sachs (a beautiful celebration of life and the history tied to us), THE MOMENTS Evening Boat Ride by Ken Jacobs (a political eternalism of stunning beauty), and A Short History by Erica Sheu (a storybook tale of a divided identity). Museum of Modern Art Documentary Fortnight Closing Night Film; Athens Film & Video Festival; Indie Memphis; Festival Encuentros del Otro Cine (EDOC), Ecuador; Currents New Media Festival, Santa Fe; Maine International Film Festival; Wexner Center for the Art; San Francisco Cinematheque; Mill Valley Film Festival; Anthology Film Archives; Three Rivers Film Festival, Pittsburgh Center for the Arts; Lightbox Theater, Philadelphia; Wellesley College; Hallwalls Center for the Arts; Union Docs Center for Documentary, Williamsburg, NY. Twelve New Yorkers born in the early 1960s across several continents “visit” every year of their lives in a brash, self-reflexive experiment about what it’s meant to live in America over the last half century. Director and participant Lynne Sachs, who wrote her own series of 50 poems for every year of her life, guides her collaborators across the landscape of their memories. She gives each person the same historical timeline as a catalyst for an exploration of the relationship between their personal lives and the times in which they have lived. Initially strangers with nothing in common but their age, the group works together writing, performing and filming. Most moments have a terrible tendency to surround us, enveloping us and swallowing us whole, before we have time to understand or process them. Much like waves, they pass through us, sometimes violently, taking our whole body for a spin and leaving us with nothing except an intense sensation and vivid memory. 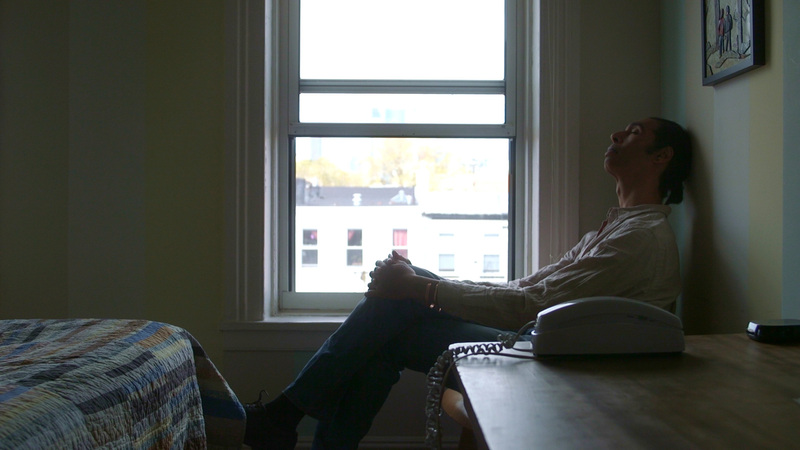 Lynne Sachs‘ latest film, Tip of My Tongue , grants us the impossible gift of trying to change that—letting us comfortably, over the course of a weekend, try to process those moments which impacted us so profoundly in the last half century. Sachs’ brilliant body of work has often focused on the curious dance between histories, the personal and global, so it is no surprise that her latest film moves across a myriad of topics with skill and grace. It’s a mesmerizing ride through time, a dreamscape full of reflection and wonder, filled with inspired use of archival footage, poetry, beautiful cinematography and music. The film flows seamlessly across the years like one of the elusive waves it is trying to catch. It raises the question of how deeply events affect us, while granting us enough room to crash into our own thoughts, or float on by, rejoicing in the company of our newfound friends. © Jon Dieringer 2010-2017. All Rights Reserved. Tip of My Tongue (2016). 80 minutes. Directed by Lynne Sachs. 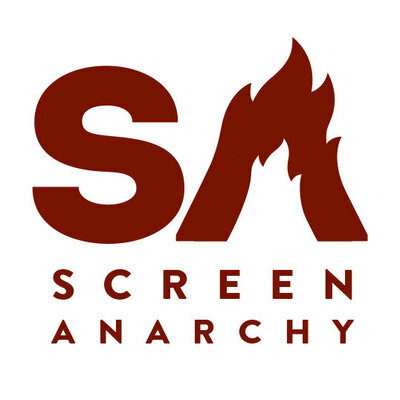 Featuring: Dominga Alvarado, Mark Cohen, Sholeh Dalai, Andrea Kannapell, Sarah Markgraf, Shira Nayman, George Sanchez, Adam Schartoff, Erik Schurink, Accra Shepp, Sue Simon, Jim Supanick. There is history, and then there is memory. Though both are hardly objective, memory is impossible to remove from personal experience. Often, what we remember from a historical moment is a strong emotion, an intimate moment, the people and objects who surrounded us when the event took place. In Tip of My Tongue, director Lynne Sachs explores the dynamism of memory through poetry, archival footage, and personal interviews; her artful collage of moments intelligently portrays the beauty that often lies hidden in the minds of those around us. To my delight, Sachs isn’t afraid to experiment. 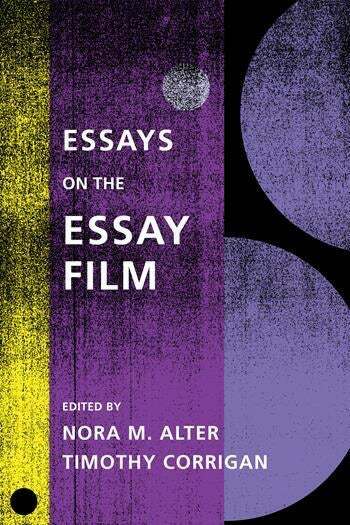 Her film begins with flashes of color illuminating handwritten notes. Dates accompanied by lines of poetry, some crossed out, appear too quickly to read while archival footage plays in the background. Our eyes only catch a few words here and there: Bob Dylan, Russian spies, the Vietnam War. The montage reminds us of how memories often live in our minds as fragmented, half-remembered pieces sprinkled with bursts of emotion. Throughout the film, Sachs uses close-up shots to confront viewers with the faces of those who remember. We hear them recite their stories in their own words, the intimacy of which reflects the individuality of each of their experiences. Audio is faded in and out to represent the fragility of those memories. 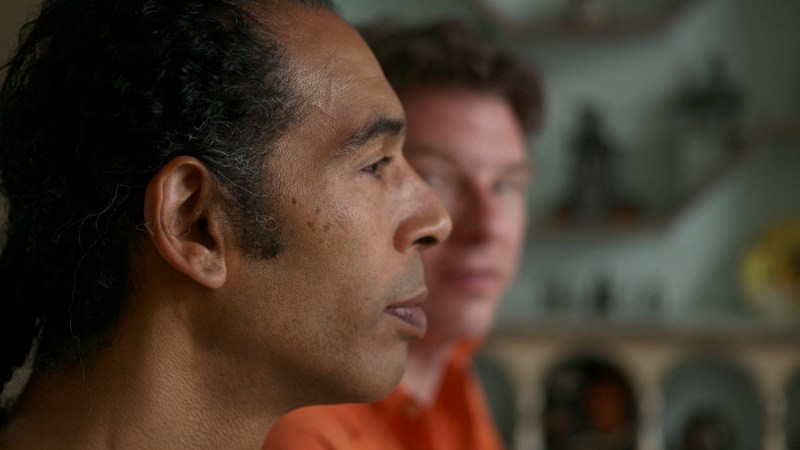 In one scene, two participants lie in opposite directions with their heads next to each other, eyes closed. Viewers can see one participant speaking but hear the other’s voice. Like so many elements of Sachs’s film, this scene has layers of meaning. When two people think about the year 1978, two completely different moments come to mind, offering a diverse experience of history. Tip of My Tongue is entrancing. As someone who was born in the mid ’90s, I am distantly removed from many of the events mentioned in the film. To hear personal accounts of the Iranian revolution or Nixon’s resignation was surreal for me, offering me a glimpse into a past I never experienced. I can only imagine the memories Tip of My Tongue would unearth for those who have lived through those same events. This film offers viewers a brilliant visual representation of what it means to remember. The metaphor one participant uses to describe the nature of political change can easily be applied to the human brain: “It’s like the paradigm of being part of an organism rather than part of a machine.” It’s hardly simple, or even logical, but isn’t the complexity what makes it so interesting? 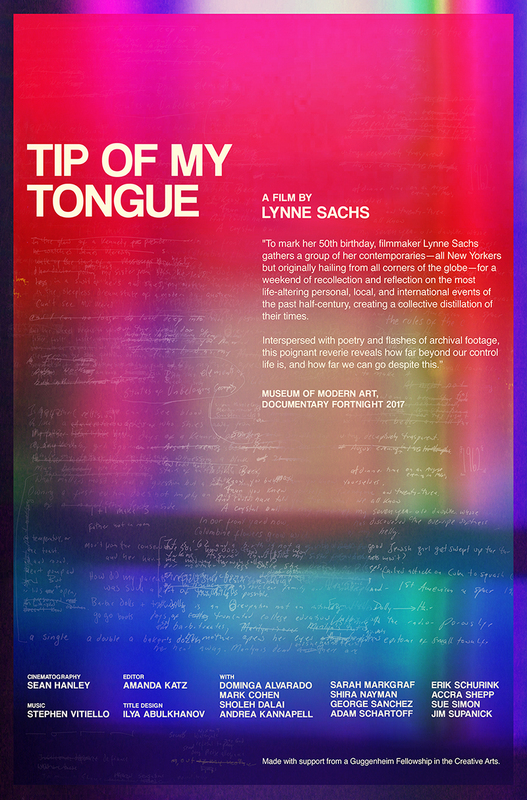 The world premiere of Tip of My Tongue will include two screenings of the film at the Museum of Modern Art as a part of Doc Fortnight 2017: MoMA’s International Festival of Nonfiction Film and Media. The screenings will be 7:30 p.m. Saturday, February 25, and 5 p.m. Sunday, February 26 in Theater 1 in the Museum of Modern Art. View the trailer for Tip of My Tongue and click here to visit Katie Grimes’s profile. This consistently rewarding survey of some of the world’s most innovative nonfiction filmmaking wraps up this weekend. Two of its best entries are by great filmmakers who have screened films before at this festival. Lynne Sachs’ latest film Tip of My Tongue, which has its world premiere as the festival’s closing night selection, is a beautiful, poetic collage of memory, history, poetry, and lived experience, in all its joys, sorrows, fears, hopes, triumphs, and tragedies. In Tip of My Tongue, to mark her 50th birthday, Sachs gathers together 12 people – all fellow New Yorkers, some friends, some relative strangers – born in the 60’s and thus around her age. The film uses archival and original footage, written text, Sachs’ own poetry, and first-person narratives of memories and experiences to explore how personal, political, cultural, and social histories intersect and affect individuals in unique ways. The cultural upheavals of the 1960’s, the Vietnam War, Nixon and Reagan, the start of the AIDS epidemic, 9/11, the 2008 financial crisis, Occupy Wall Street, and other events figure greatly in the stories told by the people gathered here. The years covered here – the numbers of which are written on various surfaces throughout the film – are rendered in exquisite visual terms, creating an artful collective chronicle of history. Supported by a Guggenheim Fellow in the Arts and a McDowell Colony Residency.